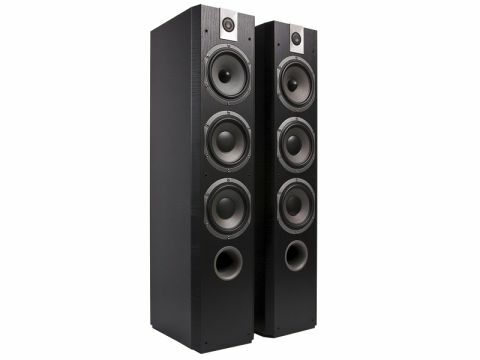 Although both the Focal 800V and 700V ranges have similar basic enclosure shapes and driver types, there are also numerous detail differences. A fair chunk of the £400 price difference between 726V and 826V lies in the elimination of the 826V's costly separate alloy plinth. Instead, the 726V comes with spikes that fit directly into the base of the enclosure, reducing the overall stability. Furthermore, the spikes themselves have thumbwheel lock-nuts that are difficult to tighten and keep tight. This £949 726V is the largest of the 700s, one step up from the 716V that we reviewed way back when. Wrapped in 'black ash' vinyl woodprint (with Amati and Wenge options), it has tapering side panels, so that the main internal faces are not parallel. The whole thing is not only quite compact, standing less than a metre tall, but also feels very solid, weighing a hefty 23.5kg, thanks in part to the thick panels and the addition of further internal bracing. A full three-way design, Focal manufactures all its drivers in France and all three cone drivers have 165mm cast alloy frames and 120mm diameter paper cones coated with 'Polyglass' micro-spheres, though the midrange unit has a different dust-dome arrangement. Focal's familiar inverted-dome tweeter has an aluminium/magnesium alloy diaphragm and is mounted in a rigid cast chassis at the top edge of the enclosure, unobstructed by the V-shaped grille. The speakers come with little perforated metal grilles protecting the tweeter diaphragms and these are easily removed for best quality. A large-diameter front port provides reflex bass loading and signal is applied to a single terminal pair. Best kept well clear of any walls, the combination of twin 165mm bass drivers, plus a 40Hz-tuned port ensures that there's ample bass output here. Indeed, if anything there might well be a bit too much – not really deep bass, rather a mild excess of the warmth and richness that's usually associated with the mid and upper bass. But this is more of a characteristic than a flaw, as the bass sound quality remains agile and informative. It drives the music along with enthusiasm and a fair amount of dynamic gusto, without adding the sort of delayed reaction effect that results from cabinet colorations, although orchestral textures can show a touch of thickening too. This isn't the smoothest or most neutral performer, but it is impressively lively and expressive, working particularly well when operating at modest loudness levels. Some might find its overall character a little too bright, either for personal taste or a particular system and it's true that the sound did show a tendency to become a little edgy and aggressive as the volume was wound up high. Boxiness is well controlled and stereo images are spacious, if slightly compromised in focus and depth. Timing and dynamic range are both good and dynamic expression is comfortably above average. On balance, the 726V must rate as a fine all-round performer at a very realistic price.